Famous Indian cricket commentator and journalist Harsha Bhogle request to end the term 'Mankading' from being used simply call the dismissal as run-out, as the family of famous Indian cricketer Vinoo Mankad find it offensive. Sir Don Bradman considered the player to get mankaded as a fair dismissal. Harsha Bhogle's post related to Mankading has left Twitter divided. What Is Mankading? All About The Mankad Way Of Dismissal That Was Used By R Ashwin to Run Out Jos Buttler In IPL 2019. The Mankading term came into limelight when Kings XI Punjab Ravichandran Ashwin ran out Rajasthan Royals batsman Jos Butler at the non-strikers end in the match no 4 of VIVO Indian Premier League (IPL), 2019. 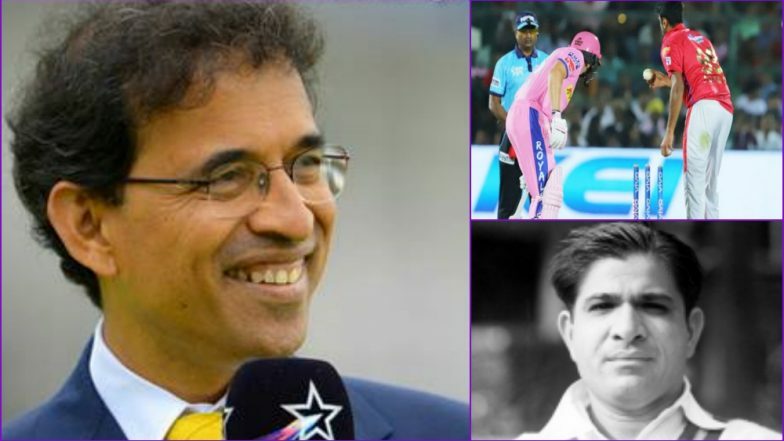 Harsha Bhogle calls to end using the term 'Mankading' and 'Mankaded' as it hurt the sentiments of family and friends of Indian cricketer Vinoo Mankad. Rahul Mankad son of Vinoo Mankad said The Print that his father is unfairly associated with the controversial dismissal, which also takes away from his exceptional record. "Mulvantrai Himmatlal "Vinoo" Mankad was an opening batsman and slow left-arm orthodox bowler. He played in 44 Tests for India, and made 2109 runs at an average of 31.47 including five Test centuries with a top score of 231. Mankad also took 162 wickets at an average of 32.32, including eight five-wicket hauls. He died at the age of 61 in the year 1978.R Ashwin’s Old Video Mankading Sri Lankan Batsman Goes Viral After Jos Buttler’s Controversial Dismissal in IPL 2019. Request.Vinoo Mankad was one of our greatest cricketers.He ran Bill Brown out legally & even Sir Don Bradman found nothing wrong. To call it "Mankaded" & look down on it is disrespectful.His family finds it offensive.Can we please stop calling it "Mankaded" & just say 'run-out'? Why people take it as an offence? If it was 'legal' and Sir Don found it 'nothing wrong', then why would anyone take an offence and find it disrespectful over being named after the said dismissal which was clearly in accordance with the laws of the game? Why Harsha Bhogle did not tag ICC and BCCI in his post? Harsha Bhogle Says ICC calls Mankading as Runout!! As per the clause number 41.16 of MCC Laws of Cricket, a batsman can be dismissed at non-strikers end by the bowler if he leaves the popping crease before the ball is being bowled. Hence, what Harsha Bhogle is making a request to the cricket universe to simply stop using the term 'Mankading' and call this type of dismissal as run out.